2000 miles one way!!!! Now that's a trip. One of these days, before I die, I'd like to take off on a 3 month trip like that. Just dawdle along with no particular timetable and see where we end up. Never seem to be able to do it. Always have to come home for some reason or another. Unlike you, I like freeways and major highways. Our rig is 12' 9" high and chugging along backcountry roads scare me. I'm afraid that a low hanging branch, or even worse, the ol' 11' 8" bridge will rip the roof off. Those backroads are the reason we tow the car. More power to you. I hope that you have a great time and a memorable trip. The main reason I personally like staying off the freeway is hauling a 33ft camper on the freeway at around 60mph with everyone else flying by at 75mph causes the trailer to start whipping around behind causing the dreaded death wobble. And I have a 12000 hitch setup with the weight distribution bars and anti sway shock. But I think I may have solved that problem. The last time I towed the camper with the SUV, I think the hitch was set too high taking the weight off the back of the vehicle and shifting it toward the rear of the trailer. I'm going to tryi lowering the hitch one hole on the adjustable shaft to bring the front of the trailer down. With the weight distribution bars, I can almost lift the rear tires off the ground. Yes, it takes the weight off the vehicle but you don't want too much weight off as it becomes unstable. Here's the rough draft of the planned route. That's also not taking into consideration the fact that the camper is a 60 mile drive from the city and it's a 4hr drive to Duluth Minnesota. 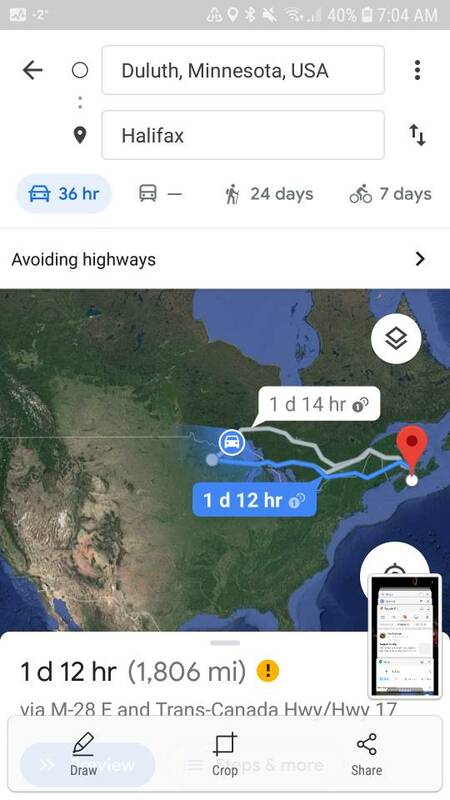 Also, if we want to do Cape breton and prince Edward island that'll add more mileage. My S-I-L had somewhat the same problem when she had her trailer. With her it was weight distribution. She had 'way too much weight (stuff) packed and stored in the rear of the trailer. I understand what you say about driving on the freeway. Our last Class "C" was a nightmare at anything approaching 60 mph. It got pushed and pulled all over the place by passing semis and box trucks. Any bumps or irregularities in the road and the front end and steering would go light. If both happened at the same time … Jeez!!! After 5 or 6 hours you were a mental and physical wreck. The new one is like a rock. It's a pleasure to drive. I'm still in awe at your planned trip. The longest we've ever done in 12 years of RVing is 1200 miles. Yes. The dreaded death wobble. I'll try adjusting the hitch. It has the adjustable shaft with 6 different settings. I'm thinking that lowering one notch and using the bars to level up will transfer some weight forward and provide more stability. For a trip that size, I could potentially do longer days and make it there in 4 days. But as they say, its not the destination, it's the journey.